Millennials, now in their 20s and 30s, dine out about 30% more than any other generation, and restaurant operators who know how to please them are most likely to win them as loyal customers. Foodies. This group sees food as an extension of their identity, and so they want to see their personal values reflected in the restaurants they visit. Connected. 92 percent of millennials own a smartphone, and 32 percent of them use it to check restaurant menus ahead of time. Authentic. Millennials have a strong preference for authenticity and transparency, with 80 percent wanting to know more about where their food is grown. Locavores. 70 percent value local food sourcing when choosing a restaurant. Environmentally conscious. This group values meat that has been ethically and sustainably raised. Health minded. Concerned about their health, the majority of millennials (74 percent) are more likely to dine at a restaurant offering healthful menu options. Millennials are what you might call “social foodies.” They eat at restaurants far more often than non-millennials, about 3.4 times per week compared to just 2.8 times per week, according to Barkely’s “Marketing to Millennials: Deciphering the Enigma Generation.” When they go out, 50 percent prefer to dine with friends, compared to about 35% of non-millennials. From posting snapshots of their lives on Facebook to Instagramming their style, few other generations like to share as much as millennials. The same holds true when they visit restaurants. Rather than ordering their own individual entrées, they prefer to split dishes, order a selection of small plates or even dine family-style. Overall, the “experience” of sharing a meal — preferably something unique and Instagram-worthy — is more important to millennials than mere sustenance. This generation has more wealth than any other, and they spend a lot of it dining out at restaurants — about $174 per month on average, compared to non-millennials who spend only about $153 per month on average, Restaurant Marketing Labs found. Not only do they prefer to consume premium ingredients, millennials are willing to pay more for them. Sixty-eight percent of millennials are willing to pay more for organic foods, and 66 percent are willing to pay more for sustainable foods, according to global consumer intelligence firm Maru/Matchbox’s 2017 “The Future of Food: Are You Ready for the millennials?” report. While millennials values are strong and their habits established, there is some room for flexibility. Thirty-five percent of millennials say they would compromise their values a little bit to save some money, according to the Barkely’s report. Variety and diverse flavors. International flavors — from Indian to Mediterranean — are a big draw for this group. Fresh, thoughtfully sourced ingredients. Serve locally sourced fresh ingredients, where possible. A balance of healthy and indulgent options. Give customers a healthful and an indulgent version of the same dish, such as grilled shrimp and fried shrimp. Plates to share as a group. 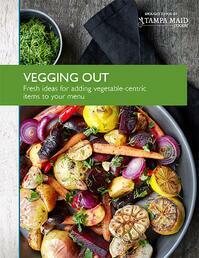 Shareable plates of fried vegetables and seafood, chicken wings or skewers are an easy sell for groups. Small plates. Reduced portion sizes are a great way for operators to experiment with on-trend ingredients and inspire trial from customers. Value-priced items. Give this price-sensitive generation a deal — two for one appetizers or small-plate versions of popular entrées. Generations and dining trends will come and go, but for now millennials remain key restaurant customers. 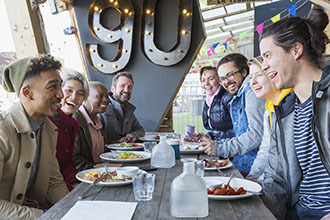 Understanding the values that drive millennial behavior and how they prefer to dine out — and then intentionally creating menus based on that information — will ensure restaurant operators will attract and retain this influential group of consumers. See our infographic to learn more about consumers hunger for value-priced appetizers! 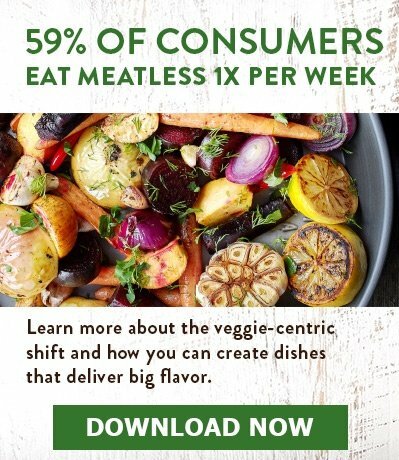 Or download our Vegging-Out White Paper, to learn what consumers expect from meatless meals plus fresh ideas for adding vegetable-centric items to your menu.